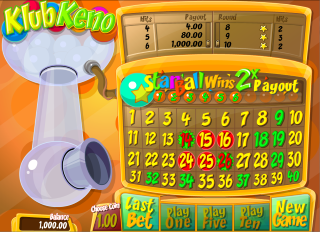 Internet casinos using Gamesys software offer a game called "Klub Keno." 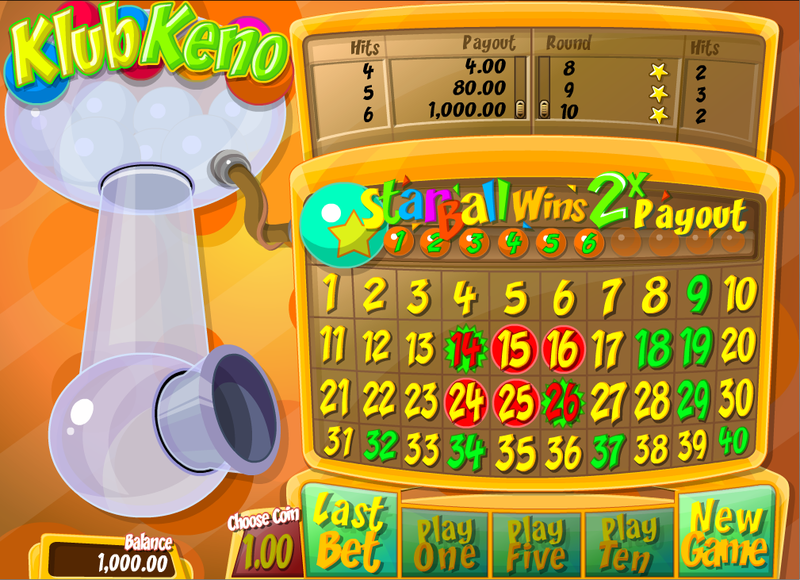 It is like 40-ball keno, except if the special "star ball" matches one of the player's picks, then the win is doubled. The following are my understanding of the rules. I couldn't find the rules anywhere in writing so I had to go off of observation. The "star ball" sometimes doesn't have a star on it, which made this difficult. If these rules are in error, then I welcome correction. There are 40 balls, numbered 1 to 40. The player shall pick 3 to 10 numbers. One of the 40 balls shall be randomly chosen as the "Star Ball." The game shall draw 10 numbers randomly. The player shall be paid according to how many of the random draw match his chosen numbers. If the Star Ball is drawn and matches one of the player's picks, then any win shall be doubled. The following table shows what each number of catches pays by the number of picks. The following table shows the number of combinations for each number of picks and catches. The next table shows the probability, to six decimal points, for each number of picks and catches. The next table shows the contribution to the return, to six decimal points, for each number of picks and catches. This table reflects the probability and effect of catching the Star Ball. The bottom row shows the total return for each number of picks. As you can see in the table above, the greatest return is for the pick-10 at 95.81%.